Continue reading What Does God’s Covenant say about the land of Israel? There are plenty of bible stories that we can read about in God’s Word. But I have decided to tell you about one of my favor bible stories and the great prophet Jonah and what God instructed him to do. This story is about Jonah and the city of Nineveh and its people which God instructed him to go there and preach repentance to all the people for their sins. Is Jesus Christ really the Only Way to Heaven and when we get there who will we see there? In this Bible Study I would not tell you a lie about such an important place that our Lord Jesus instructed the Apostle John to write about in the last book of Revelation. Now in the last two chapters which is 21 and chapter 22 of the great book of Revelation, John tells us of a beautiful place that our Lord God has made and it is called Heaven. Continue reading Is Jesus Christ really the Only Way to Heaven and when we get there who will we see there? What Can We Do When Sickness Comes to a Love One? The bible is made up of many stories but they all fit together to tell one story and that is God’s story. Remember our God doesn’t always give us a story book ending. We do not always end up with the answers to our prayers that we desire. But God often chooses to do something different with our life than you envisioned. But that’s ok, He still loves us and He’s still our God and His name is (Jehovah) or some prefer to call Him by the name (Yahweh). Continue reading What Can We Do When Sickness Comes to a Love One? I believe that God said that He would bless those that blessed His people, the Jewish Nation. Also our God said that He would curse them that cursed His people the Jewish people of the land of Israel in (Genesis 12:3). Our forefathers came to this land of America, so they could practice the freedom of their religion and worship our God, (Jehovah), in this country called America. I would like to let you know that our God has serval names in the Bible. What Does Our God Say About Traditional Marriage in His Word? Now our society is steadily sliding into more sexual immorality every day and I would like to say that this is a very terrible and gravely sinful condition to be in with our God. For more than four decades we have been sliding into this sexual revolution which began back in the 1950s and sixty’s. Continue reading What Does Our God Say About Traditional Marriage in His Word? Now our society’s is steady sliding into a more sexual immorality every day and I would like to say that is a very terrible and grave sinful condition to be in with our God. For more than four decades we have been sliding into this sexual revolution which began back in the 1960s. God is clear about helping the poor. When the Holy Spirit convicts your heart and you began to read God’s Holy Word, then you will see his word with fresh eyes. Now as I read the scriptures about the poor I could see that their need was everywhere. Are you ready to take the 90 day Challenge? I am taking the 90 day challenge to read the bible cover to cover. 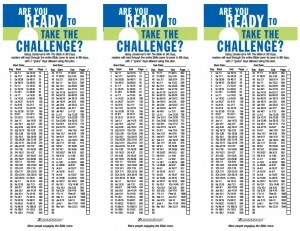 You can take the challenge with me. Print off the following schedule. There are three schedules per page. One schedule for you and two for friends. Click on the image below to view and print the schedule.